BC Tip: IBM – A smart campaign page? 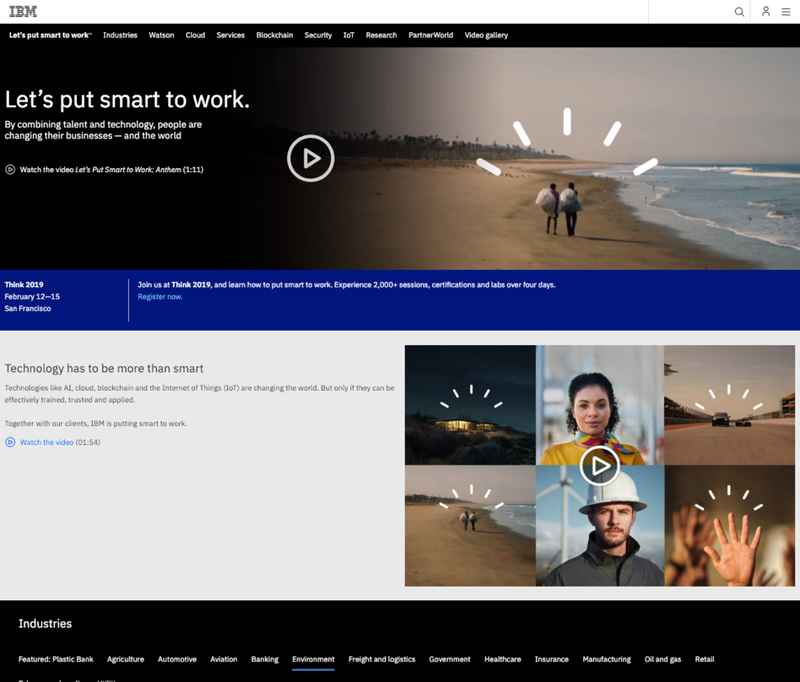 IBM created a portal page as part of its 2018 ‘Let’s put smart to work’ brand campaign to help direct users to relevant material around its large digital estate. The portal has several videos, presumably created as part of the campaign, as well as links to upcoming events. An ‘Industries’ area on the page collates links to case studies and blogs in other parts of IBM.com, such as its Internet of Things Blog. What appears to be a navigation bar at the top of the page takes users to dedicated IBM sites for products or services, such as Watson. The creation of a page to support a campaign by making use of existing materials is, in many cases, a sensible idea, especially if the campaign itself directs users there. IBM’s page certainly gives users a good idea of the wide range of engaging stories it has produced, which demonstrate how the company’s services can help its customers in many different industries. But the problem with this particular page is that it has no obvious home in the IBM estate – indeed we stumbled across it rather than finding it through IBM’s navigation. It is still being updated, as the advertisement for an upcoming event shows, and the information it showcases is still relevant, but we suspect that few users will be finding the page now, some months after the campaign’s launch. None of the links we found on the page - including the ‘navigation bar’ - indicated where the user was being taken, even though IBM.com is effectively a vast federation of microsites and blogs with at best loose connections to each other. So users who follow the links will likely end up disorientated in one part or another of the estate. BP has an online magazine which is one of the main sections of its website. At the end of 2017, BP selected nine images which it had previously published in the magazine during the year to create a new article ‘Picture show: the faces and places of BP in 2017’. The images are varied, ranging from an employee working in a laboratory to schoolchildren at an event to a landscape of an offshore platform. Each one is titled, credited to a photographer and has a short caption. The feature was posted in the Observations sub-section and heavily promoted around the site, including on the global home page, and on the company’s Twitter feed. Individually the images are impressive, but taken together their impact is increased. The user is drawn to scroll down the page to see all the photos, partly by the strength of the images, but also by the bold titles such as ‘Line of sight’ or ‘The colour purple’. The images seem to have been chosen and captioned carefully to convey the wide range of projects and locations that the company operates in, to convey key messages, and to provide a retrospective on the year. For example, the top image ‘Hanging out’ is of an employee high up on rigging, installing equipment on a platform. Not only is the image stunning, with the operator in the foreground far above a ship in the background, but the fact he is wearing safety gear – and that the caption underlines this – is designed to communicate BP’s approach to safety. A link to a magazine article from April 2017 on the company’s North Sea business, where the platform in question is located, is an effective way of drawing the visitor in to related information. Crediting the images is a nice touch too – not just to recognise the photographers, but it also helps add to the magazine-feel of the piece. One criticism is that the original articles in which the photos were published are not linked: this would add context and interest. Overall this is a powerful way of telling the company’s story and engaging the website’s visitors, simply by reusing valuable material the company already has. A useful pointer for companies that could be helpful not just at New Year, but at any time in the editorial calendar. Design elements from an online special feature could be adapted for corporate stories. ‘Tampa Bay’s coming storm’ is a special feature on the Washington Post’s website, published in July, about the disaster that could unfold if a strong hurricane hit the Florida city. It is full of creative animations, illustrations, embedded videos and professional photography; with interesting arrangements of the elements to increase impact – for example, as readers scroll down the page, a pull quote from a government official appears alone against the backdrop of an animation of a hurricane. The Washington Post feature represents the best of online journalism at the moment – great writing combined with unique and eye-catching visuals, all of which make the most of the web as a medium. You continue to scroll because the writing is compelling and the design elements keep surprising. Companies with the appropriate budgets should consider adapting the ideas in the ‘coming storm’ feature to engage with readers and make their own online stories more memorable. The social media giant’s web estate is fragmented and often frustrating to navigate. However, there are pockets of brilliance and originality; and signs that the company’s approach to online corporate communications is maturing, Jason Sumner says. In the last few days, we’ve been doing our annual check of Facebook’s web estate to help keep our Index of Online Excellence up to date. Since we last looked in detail at the firm’s online presence in 2015, the all-conquering social media platform has become one of the world’s 10 biggest companies by market capitalisation and now has 1.8bn monthly users. We think it’s unlikely that Facebook will break into our top 30 ranking though. It has too many weaknesses, the most obvious of which is fragmentation, something that it has in common with a lot of US technology firms’ online estates. Journeys to information for anyone who is not a signed-in ‘user’ are often difficult, with an array of dedicated Facebook pages and microsites that have different navigation systems and do not always link up neatly. • It is highly effective at providing online information for its customers (advertisers and potential advertisers), an issue that is front of mind for digital managers we speak to. • Careers pages are at global best practice standards. • Visually speaking, much of the estate looks elegant and parts are outstanding. We also saw signs that the company thinks ‘corporate’ online audiences such as investors and CSR professionals are worth trying to serve better too. Facebook.com/business is the gateway page to resources for advertisers. The material here is clear, straightforward and well-targeted to the audience. The calls to action anticipate some ignorance about the basics of Facebook’s business model and address it – ‘How Facebook adverts work’ – or, for those already in the know, ‘Create Advert’, which leads to a step-by-step process to set up an online campaign. There is abundant and useful supporting content, including clear, succinct video tutorials, FAQs, case studies, pricing information, metrics, etc. Careers information on Facebook.com was strong when we looked in 2015 and it is strong now. On digital careers metrics alone, we rate Facebook among the best online estates in the world, and well worth emulating. Jobseekers receive a top service, with the global vacancy mechanism and careers information provision at global best practice levels. The online application form is excellent - elegant, streamlined and appropriately targeted at digital natives. The ‘Careers hub’ provides a very effective pitch to prospective jobseekers, positioning the workplace as a lively environment in which staff are encouraged to pursue their ideas and make a real difference. Facebook has made some improvements in the way it communicates with traditional corporate stakeholders such as investors and CSR professionals. In 2015, we noted that their investor landing page stood out for its boring conventionality (even if their recent quarterly information was very well organized). Since then they have launched a modern-looking microsite for investors that is much more in tune with the company’s visual style. Although it falls short of best practice (we could not find a quarterly results archive, for example), the microsite is a step forward. In 2015, we could not find any CSR data. In our most recent visits, the Sustainability microsite had a long scrolling page of creative data visualisations, housed under ‘Our Footprint’, covering carbon emissions at data centres, the energy mix between renewables and fossil fuels (including its goal to be using 50 per cent renewables by 2018), and water usage. The site provides a PDF download of all the data and a useful list of links to external resources about Facebook’s environmental performance. The page has links to interesting real-time dashboards tracking ‘power usage effectiveness’ and ‘water usage effectiveness’ at Facebook’s four data centres. The Sustainability microsite is a good example of the site’s often striking visuals. It uses (currently-trendy) looping video on the landing page, original photography, clean fonts and colours to tell make the company’s case that it is a force for good in the world. ‘Facebook Stories’ are another example of professional visuals combined with high-quality editorial. Housed on a microsite, they are a set of well-produced videos that cover what ordinary people have accomplished by setting up Facebook groups. Many of the videos have CSR and community-based themes, including 'Homeless in Seattle' about an architect who has a page 'Facing Homelessness' and 'Save the Monarchs', a group in Iowa dedicated to butterfly conservation. The production values are high, and may well be outside many firms’ digital corporate communications budgets, but the way the videos are summarised on the page, and the way the videos are subtle about connecting Facebook to the groups doing the work, could be a model for other corporate 'story' videos. Overall, we were struck by the imbalance between how frustrating it can be to find specific information on the estate, and then being impressed by the abundance and detail when we got to the right places. It is a good thing for Facebook, given how frustrating our journeys were, that the estate tested very well for visibility on search engines. Users starting from the home page could struggle, for example, to find the links for journalists, investors or sustainability, but putting these terms into Google returned the exact destination at the top of the results every time. Does stating how long it will take to read online articles make for more ‘engaged’ readers? The Pool, an online magazine aimed at women that was launched last year, puts labels on all of its stories and videos saying how long they will take to consume. Subject feeds, under ‘News & Views’ and ‘Fashion’ for example, promote articles with a headline, summary and a circle saying ‘1 min’, ‘2 min’ etc. The articles themselves have these circular signposts as part of their headings, sometimes appearing right under the title. The drop-down panels in the primary navigation also use the device for featured stories. We can see the appeal of signposting reading or viewing times for online stories, where attention is scarce and infinite scrolling automatically invites the question – ‘when will I get to the bottom?’ The scroll bar used on most sites does the same thing but less explicitly. As a reader, there is a comfort in knowing ahead of time how long it might take to get through a piece. Time stamps could be appealing in a corporate context (and we have seen at least one corporate online magazine using them). However, clicking around the Pool even briefly, all of the signposts can start to make the site appear unduly preoccupied with time, although this may play into the brand’s attraction for a ‘busy’ audience. The precise timings, 1 minute, 2 minutes, 23 minutes, etc, invites the cynic to ask who is the presumably ‘average’ reader on which the measurements are based; maybe better to be more vague – ‘short’, ‘long’, or time ranges. Used sparingly and in the right context, it can’t be a bad thing to let people know a rough idea of the time investment before they click. The tech giant wastes high-quality editorial by burying it in the online annual report. IBM’s 2015 online annual report features ‘150 stories of IBM today’ in six categories – cognitive solutions, cloud platforms, ecosystems, clients, research and people. The primary navigation makes reference to the nuts and bolts of annual reporting – financial highlights, stockholder information, etc – but the stories take centre stage. Visitors can scroll to ‘explore all’ stories or browse by category. The stories we looked at are visually and editorially impressive, employing the latest online publishing techniques and multimedia to engage readers; and they look good on mobile or desktop screens. IBM’s stories are impressive, but it is a waste to publish them in the online annual report. People only usually look at annual reports once, whereas this material should be given the widest possible audience, and the big traffic is likely to be on the main website. There tends to a be a viewing surge for annual reports when they come out, then a steep drop in interest, largely because they are usually promoted for a few weeks then forgotten about. Annual reports are also ‘frozen’ (by law for the audited material, but that means everything else is frozen too) - so the opportunity to constantly provide new stories and build an audience is lost. It is a symptom of the ‘annual report first’ mentality that still dogs companies. Our view is that you should put material that is compulsory in the annual report - mainly statutory audited material (this is exactly what IBM does in the PDF version of the report). Everything else should go on the main site, boosted where possible by social media. Nielsen Norman wrote up an interesting test this week to show that ‘tone of voice’ on websites made a difference to how companies were perceived. Not surprising, but it’s nice to get proof that what should be true is true. It started me thinking about tone of voice on corporate sites – something we monitor constantly in our work, but rarely attempt to analyse. When it comes to navigation, we always insist that corporate sites are different – if you apply the same rules to them as you would to a brand, or a news, or a social media site, you will run into trouble (evidence in plenty from so many modern sites). With tone of voice, the opposite is true. That is not say that it should be the same across all types of sites, but the same basic rules apply. I’m not convinced that there is such a thing as ‘web writing’ – or at least no more than there is ‘book writing’, ‘news writing’ or ‘legal document writing’. Each needs a form of expression that is appropriate to the medium, but anyone who knows how to produce good written English (or any other language) will be able produce words that work in their context. Words please, or perhaps copy, or editorial – but not ‘content’, that killer label that drains the magic out of an art. ‘That Shakespeare, he did great content’. Yeah, right. That said, there are a couple of things you should bear in mind when you are writing for a corporate site (or editing words produced by others). You need a basic understanding of how to please search engines. Not difficult to learn, but it can take skill to ensure that what you are writing are both ‘good SEO words’ and ‘good words’. Many of your readers will not be native speakers. The chances are your main site is in English (perhaps in parallel with your local language), but you can be sure that a good proportion of your readers will not be anglophone. But even this last point is not really a differentiator from other forms of writing – it’s just a matter of being aware of your audience, as any good writer will be. Journalists know to keep language simpler when they are writing for popular papers than when they are writing for more serious publications. Same if they are writing for people who do not share their native language. Only a very few novelists have the luxury of using the words that they want without thinking about their readers. So any good writer of English should be able to produce words that are engaging, clear, suitable for the medium and the audience, and transmit the messages you want in the correct tone of voice. Easy, so why do so many websites fail to do all or any of those things? Because there is an acute shortage of ‘good writers of English’ employed to do the job. Using someone simply because their first language is English is not good enough. Most English speakers do not write well. I was talking to the manager of a continental multinational and pointed out that some of the English on his site, while not grammatically wrong, was inelegant and sounded unnatural to my (anglophone) ears. ‘But our agency uses a British guy to do that,’ he said. He clearly was not a British guy with a good feel for his language – you need an experienced journalist, editor or copywriter. And even then be careful: I used to edit features on a London daily and some of the words handed in by professional journalists were poor indeed. The good news of course is that there is ample supply of good writers who are short of work – put out of work by the internet. Hire them now – they’re lovely and cheap. A French insurance group’s online stories make excellent use of different editorial techniques to engage readers. ‘Spotlight’ is Axa’s online magazine, linked via the primary navigation on the French insurance group’s corporate website. Described as ‘a journal of ideas, experiences, and the people that make them’, Spotlight covers themes especially relevant to its customers, employees and jobseekers – protecting the environment, customer stories, the future of insurance and the future of work. Within each section, image panels with teasers promote individual stories, with the invitation to ‘Read more’ or Discover more’, linking through to the full-page articles. Insurance companies are usually trying to dispel the idea that they are boring and old-fashioned. Axa’s Spotlight storytelling section helps counter this image by making excellent use of editorial techniques, including documentary photography, pulled quotes, embedded videos, data visualisations and subheadings that break up the text. This makes the company's stories easy and enjoyable to read on screen. The responsive section provides an equally good experience on desktop or mobile. It also helps that AXA frames its stories within categories that are inherently interesting and relevant to its stakeholders, such as 'Future of Insurance' and 'A New Way to Work'. It is brave to do ‘content marketing’ without ever mentioning the brand. Brave, because ‘content’ without any ‘marketing’ is usually for the chop when budgets are decided. GE appears to have pulled it off with its popular sponsored serial podcasts –fictional stories no less – and it is worth asking whether corporate digital comms could learn anything from the GE’s success. Could they (or should they) try to do something similar? GE’s special circumstances are probably not widely shared – namely, an obviously big budget and senior managers with open minds. Still, corporate websites should be an ideal platform for compelling, brand-free stories. The context around the story is everything – if there are cues, links and contact details to satisfy the marketing folk, the story itself can stay pure. Maybe fiction is taking it too far, but if the content is interesting, and reasonably on topic (eg, a fictional story about battling cancer on a pharmaceutical website), and it attracts eyeballs (or ears in the case of podcasts), why not?